This installment of Dynasty's Featured Artist takes a turn toward fiber arts. 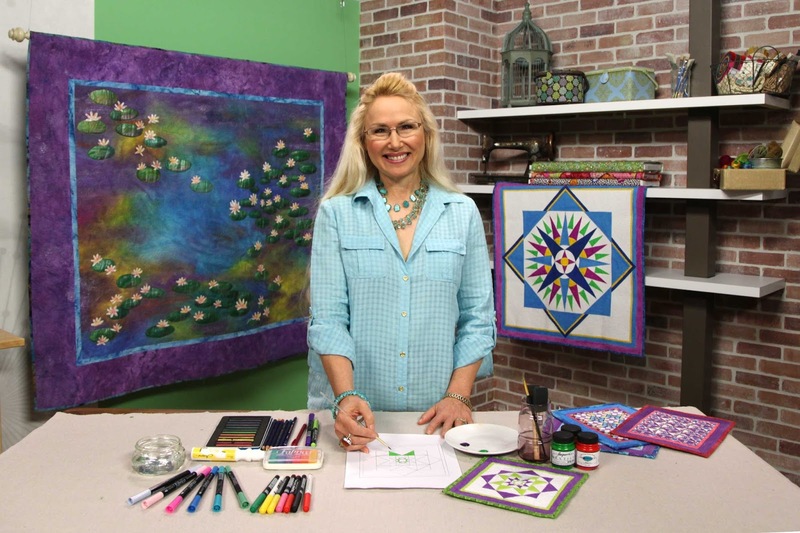 Allow me to introduce you to Cindy Walter--author, television host, and quilting instructor who paints on quilts instead of canvas. Let's get to know Cindy! How long have you been quilting and when did you start painting your quilts? What gave you the idea to combine the two? 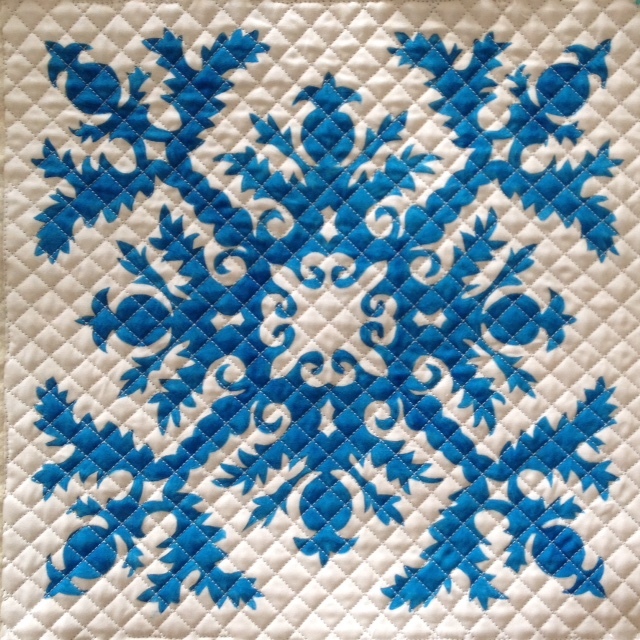 I’ve been quilting since I was very young, but did not work in the field until about 1990 when I took a quilting class and realized I could teach the topic better with more information. I first taught very traditional quilting technique, and still do. In 1995, I wanted to paint on my quilts but was intimidated by paints. So I created the Snippet Sensations© technique in which you put a fusible glue on the back on the fabric, cut snippets of fabric and use these to create a picture. This technique was very popular, enabling me to teach all over the world and sell over 100,000 copies of my books. At some point, I decided it would be easier to just use paints. My first book on the topic was co-authored with Jennifer Priestley in 2002, The Basic Guide to Dyeing and Painting Fabric. After almost a decade of experimenting and creating I decide to write a different type of fabric painting book in 2011 called Fabric Painting with Cindy Walter. This last book truly combines my love of color, mixed media and quilting. What sort of paints do you use on your quilts? I use acrylic paints made for fabrics or textiles. All type of paints can work to some extent on fabric. But the main needed attribute is the paint must be permanent and washable. This quality is found in acrylic paints, omitting watercolor and oil paints. Another desired quality is a soft hand once the paint is dry, this can omit artist quality acrylic paints. There are endless mordants to add to regular acrylic paints to turn them into paint for fabric, but I have found for the most part they don’t work well and are expensive. Fabric paints are not expensive and will give you the best results. For pictorial type of pictures you must use opaque or thick styles of paint. I also use transparent thin styles of paint for coloring fabric and fun techniques like heliography. Do you have favorite subject matter to paint? Why? Using paints on fabric is not easy and very different than painting on paper or treated canvas. I prefer simple easy topics such as a flower. I’ve also created the technique of actually painting quilts instead of piecing or appliqueing. Such as painting the mariners compass instead of the difficult piecing process or painting an Hawaiian quilt instead of endless applique. I teach this at the quilt shows. Do you have a favorite quilt pattern? Why? No, I’m unique in the sense that I like all styles of quilts and patterns, from historical traditional techniques and quilts, to very abstract modern styles. I teach the whole range. Do you have a favorite Dynasty Brush? Yes, definitely. The acrylic paints tend to be heavy bodied, so you need a stronger flat brush to pull the paint. I use Mastodon Shaders, from size 2 up to 12, Eye of the Tiger Flat, and Dynasty series 1610, 1350, 151, in flat or bright. I buy these all by the gross for my student kits. What keeps you happy while working? Color, I love color. And color can set my mood: orange and brown – YUCK, cherry, yellow and blue – PURE JOY. Do you have any advice for those who want to combine quilting with painting? Experiment on scraps of fabric first. Maybe color a lot of small pieces with transparent paints in which you can sew together to make a pieced quilt top. Then work with thicker paints and experiment painting pictures on small pieces of fabric. The key is experiment, play and enjoy the results. I live in Hawaii with my husband, Michael A. Lilly. I’m surrounded by inspiration and I love to share this inspiration with others that is why I travel and teach. Before you are jealous that I look out at palm trees and the ocean every day, realize traveling to/from Hawaii on every business trip is not easy. But no complaints. 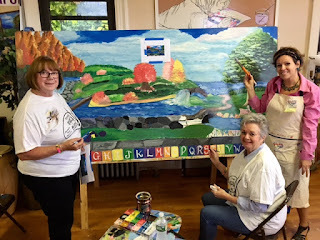 I teach some type of painting class at the large quilt shows such as International Festival or American Quilter's Society, on quilting cruises, and I love teaching for guilds. Another way to attend my workshop is on Craftsy--(I get monthly discount coupons to give to students so friend me on Facebook). All photos in this post appear courtesy of the artist. As always, you can explore the Dynasty brush collection and MORE on our website. If you missed the previous post about the Dynasty Brush Paint Night with Splashes of Hope, click here. 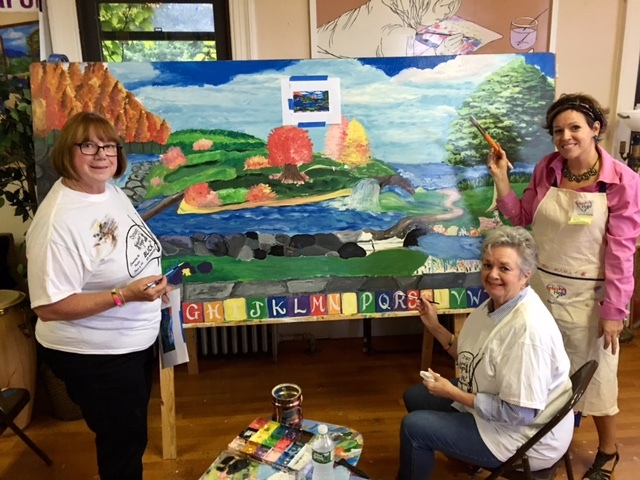 I taught a three day painting seminar with the Decorative Artist of Western Nassau Chapter (DAWN) in Long Island, NY and invited Veronica Towey (Dynasty Brush Director of Marketing) over so that the painters could do some brush shopping! They scooped em up! They loved having Veronica there and enjoyed a pop-in visit from Greg Mink, Dynasty's Vice President of Sales. 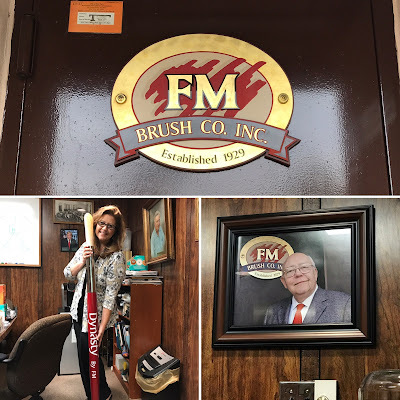 This was my first trip to NY and to the FM Brush Company and they made me feel right at home and part of the Brush Family! I noticed immediately what a tight-knit family-run business FM Brush is! 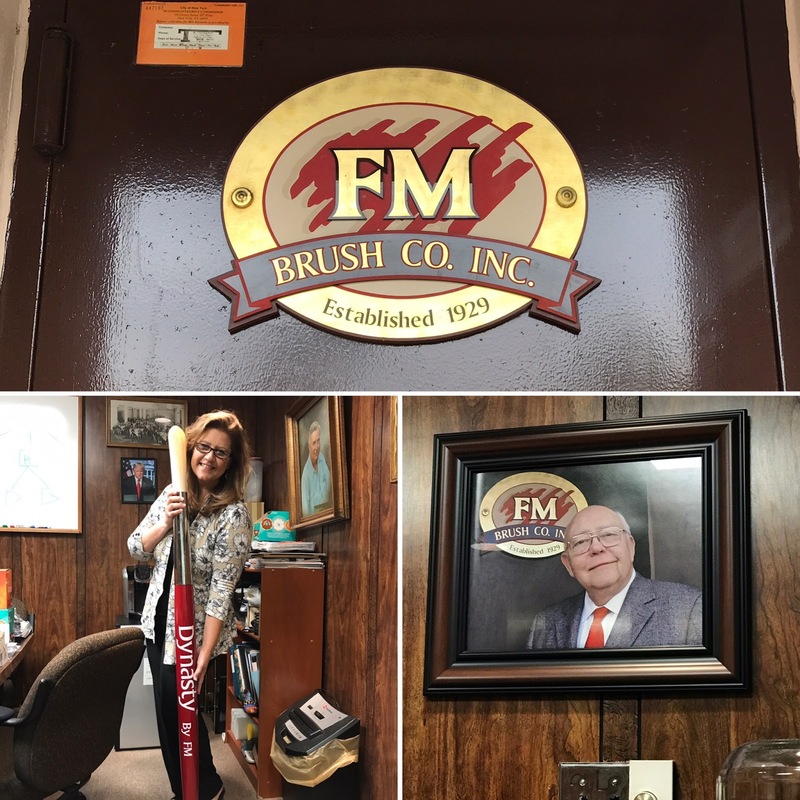 There is a genuine passion that can be felt in the building and in talking to the people in the office as well as the brush makers--to carry on the family business and make the absolute best brushes available. The factory tour was amazing! I got to see where and how the brushes were made. From loading the ferrule with the best bristle materials available, to the crimping of the ferrules on the handles--with a beautifully crafted antique crimping machine. it gave me that much more appreciation for the love and craftsmanship that goes into creating every single last brush! The DAWN ladies were invited to attend the Dynasty Splashes of Hope Event and we were all thrilled to see so many of them show up to help paint on the murals. 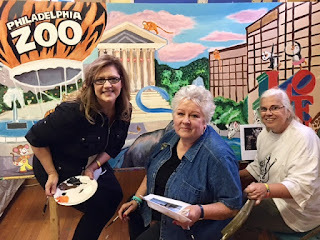 Several ladies returned to continue working on the details of the murals which was AWESOME! The venue was spectacular! Who wouldn't want to have their studio spaces in a castle?? Tony, the videographer, taped some educational and informative brush tutorials with me and fellow Dynasty Artist Shar Sosh. Splashes of Hope Ambassador Ethan shared all of his special and favorite Dynasty brushes with Tony. Splashes of Hope Face Painter Sandy painted up faces using Dynasty Theatrix brushes. The entertainment of a live one-man band performer set the mood for fun, fellowship and lots of paint slinging! Thanks for sharing your experience with us, Sandy! If you want to see more about what Sandy is up to, be sure to follow her on Facebook, Twitter, and Instagram. If you want to learn more about all of our Dynasty Artists, click here. And if you want to learn more about how you can support Splashes of Hope, visit their website. Looking to browse our vast selection of brushes? Check out our website!